Water aerobics promotes weight loss and is easy on your joints. If you're trying to lose weight and get in shape through healthy eating and exercise, you might run the other direction if someone tells you about a program where you "just add water." Not so fast: The Centers for Disease Control and Prevention recommends at least 150 minutes each week of moderate intensity aerobic activity, and that can mean water aerobics as well as dry-land pursuits. It works wonders for anyone, regardless of ability or fitness level. There is no magic formula for how much weight you will lose when you exercise. How many of those pounds you'll actually shed through water aerobics will depend on your current weight, how much muscle you have, how often you work out, and whether you follow a healthy low-calorie diet to assist with weight loss. 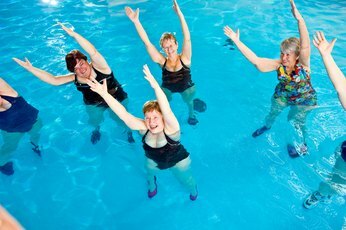 On average, according to Mayo Clinic, a 160-pound adult who does an hour of water aerobics can expect to burn about 402 calories, so in order to melt away 1 pound, or 3,500 calories, with exercise alone, it will take about nine hours of water aerobics, or three hours a week for three weeks. But wait, there's more! An added bonus to water aerobics is that water adds resistance, resistance builds muscle, and muscles help you burn even more calories. The buoyancy of the water is easy on your joints, and working out in water will help tone muscle. Water, explains the American Council on Exercise, adds resistance and packs the added bonus of a low-gravity environment. Water's buoyancy will shut out the jarring and jolting you might get training outside of the pool -- perfect if you are pregnant or want to stay off the sofa while recovering from an injury. Working out in water, according to ACE, will help you build flexibility, allowing you to do stretches in the water you couldn't do on land. Any equipment you may need for a water aerobics class is usually provided with the program, but you may want to get some aqua shoes or socks that help keep your feet from slipping on the pool bottom. Can’t swim? No worries, just choose a class taught only in the shallow end. In most water aerobics classes, no swimming skills are needed. While it’s definitely good to be comfortable in deep water for some of these classes, you don’t need to be a strong swimmer; just throw on a specially designed flotation belt or vest and away you go. You may worry that you won't get as good a workout in the water as you do in a land-based aerobics class, but cast those doubts aside. As long as the class is taught with similar intensity, duration and frequency as a land-based class, according to the Aquatic Exercise Association, there are no differences in the effect of aerobic activity between the water and land, which means guaranteed calorie burning. For those who want the benefits of a zero-impact aerobics class, there are deep water-only programs that include aqua jogging and deep water running class formats. From kickboxing to boot camp, Latin dance to traditional aquatic fitness, you’ll find a water aerobics class that suits your needs.